Woodworking projects for kids are a frequent item in my shop. One of the challenges, especially on wooden toys for babies and toddlers, is how to finish and protect the wooden toy in a safe non-toxic manner. A classic kid safe wood finish consists of mixing beeswax into mineral oil. Both of the “ingredients” are safe and non toxic so if the little ones chew or teethe on their wooden toy there is no need to be concerned for their health. This makes it the ideal kid safe wood finish. The first step to make our safe non-toxic wood finish is to finely shave some of a beeswax block. 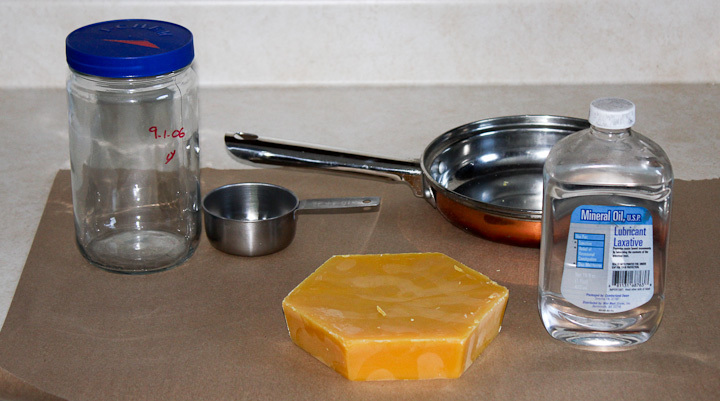 Beeswax is not as common as it once was in local stores. I order mine as I use it often for woodworking but small 1oz packages are available at Ace Hardware stores still. 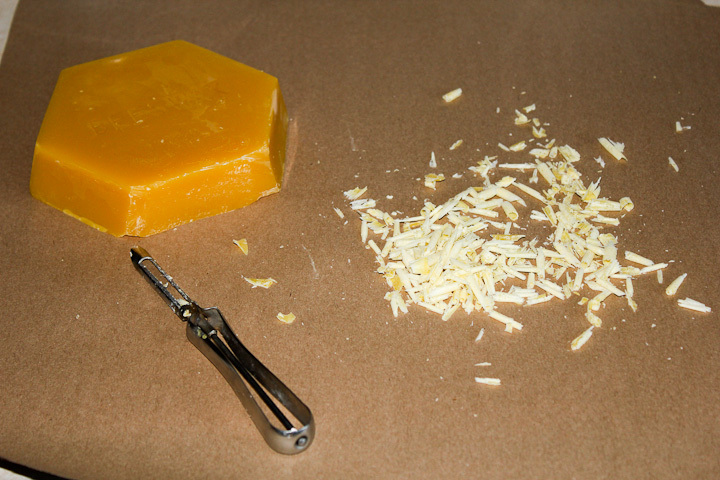 I shave the beeswax on a piece of kraft paper to help contain the sticky wax shavings. This makes clean up after the project easier. Into a single pint of mineral oil (available at most pharmacies) add a well packed slightly heaping one half cup of beeswax shavings. 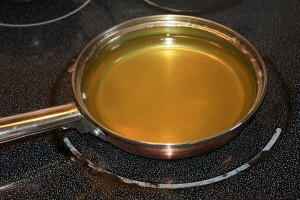 The next step in making the non-toxic wood finish is to pour the pint of mineral oil into a pan. I have some heavy gauge stainless pans purchased at a yardsale that I use for project “cooking”. Then add the packed half cup of beeswax shavings. 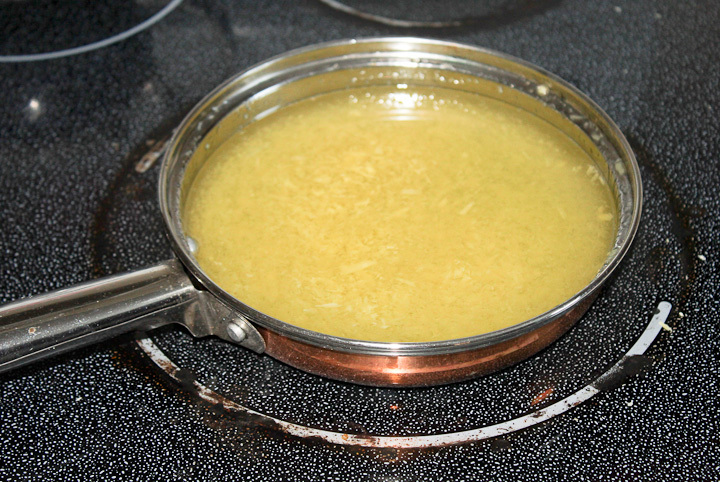 Using the low setting on your cooktop, slowly heat up the mixture. Be sure to stir constantly. 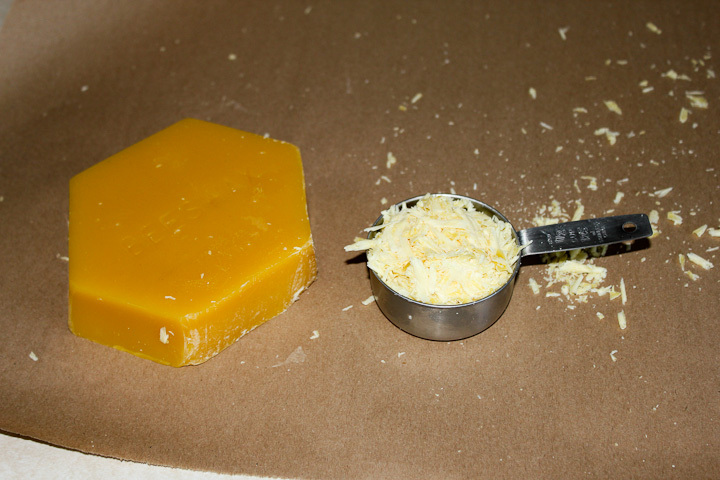 It should looks like the left upper photo after you mix in your beeswax shavings. As soon as the wax is completely dissolved remove your mixture from heat. The solution of wax in mineral oil turns clear as in the upper right photo when it is time to remove from the heat. You do not want to add more heat then it takes to melt all of your beeswax into the oil. 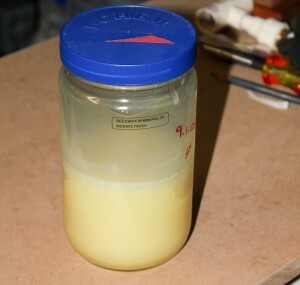 To store your child safe non-toxic wood finish, pour it while still warm into a large glass jar. You can use the finish immediately as a warm liquid, but as it cools it turns into a soft brushable paste. Application is very easy. Simply brush on a liberal coating to your wood project and let the finish soak into the wood for 10 minutes. Then buff with soft cotton cloth to remove any excess finish. The little baby rattle toy was the purpose behind this batch of kidsafe wood finish. The little dinosaur baby rattle is available at my etsy shop for purchase along with a fish rattle and flower rattle. They have been kid tested and mother approved. The cooled finish is a soft brush-able paste. If you leave it in a sunny window on a warm day it will liquify again if you prefer to use it that way. I’ve found no discernible difference between using it as a paste or a liquid on wooden toys. I like to let this finish sit on the toy for at least 24 hours before I buff it out to a soft natural look while removing any excess with a soft cotton cloth. great stuff. thank you for sharing!!!!!! Thanks! I’ve started making toys for the grandkids and needed a child safe finish. This will do the trick. Glad you found it useful Darrell. It’s a very easy way to safely finish wooden items for small children. I’ve never had it go bad, I think it would be hard for it to spoil without some sort of external contamination. Usually one batch (~a pint) lasts me 6 months to one year and it’s been fine for that long. I store it in a cool dry location out of direct sunlight when it’s not in use. will you ship into Canada ever? I am able to pay in U.S.funds if that is the issue. Mesg me through the etsy system and I will figure out shipping for you if you want one of my toys. could you flavor it? or color it? I suppose you could flavor it, I’m not sure that’s a good idea, but with something like a flavor oil (raspberry, lemon, lime etc) it would smell nice. I have never done anything like that. I have not tried to color the child safe finish. 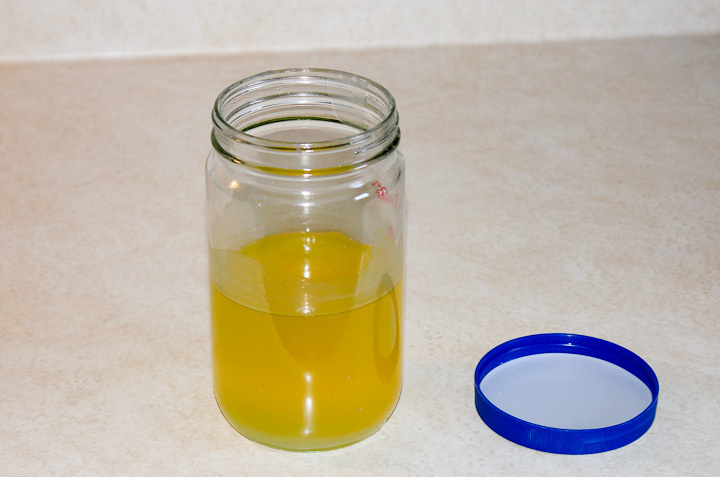 You could use some natural oil soluble dye as a colorant perhaps? I enjoy the natural wood look on my creations. I occasionally use childsafe non toxic paints from the craft store on toys when I want them to have some color. Hi , may I ask can I use olive oil with the bees wax. It is possible in so much that Olive oil will work to make finish. I’m not sure about the solubility of bees wax in olive oil but it should be similar. However, I believe food oils can go rancid with time and should be avoided. Excellent tutorial. Thanks for putting it together. Am making a set of wooden blocks for my granddaughter, and feel safe with applying this to them. Hope your granddaughter loves your creation. Hand made gifts are the best kind in my opinion. I did catapults this year for all the lil boys. They loved them. Hope to post on it soon. Hi Emma, That unscented baby oil should work fine. Paraffin is a polyolefin based wax. I put on 5 coats and buffed each coat on buffing wheel. Looked nice. Gave it to my 9 month old grand daughter. She licked and chewed for 1 day and it was down to the bare wood. why did it Not soak in very well? This finish isn’t going to survive serious teething/chewing. No finish will. What type of wood was your item for the Grand Daughter. I typically leave the oil/wax on in a heavy coat for a week in a warm place to let it soak into the wood. Sometimes I reapply it if the wood is really thirsty. This type of non curing oil finish isn’t great with some types of oilier wood or if the wood isn’t really dry as much of what we get straight from the yard is these days. Are wooden beads by themselves still safe with NO finish on them??? The wood by itself unfinished should be ok. The mineral oil and beeswax finish keeps it from a little ones saliva and icky things growing into the grain of the wood by sealing it up and making it somewhat water resistant. Thanks. Painting building blocks for my one year old grandson. Your finish is perfect as I was worried about toxicity. Jeanne. Hi, I have read that mineral oil in the human body can contribute to the development of auto-immune disorders among other nasty things…perhaps you could tell me what some good substitutes might be? You said food oils can go rancid, what about jojoba oil or castor oil?? Would those work well? Thanks! Why not leave out the mineral oil and just use heated beeswax as a finish? I was using unscented hard candle wax to finish wood balls I was using for knobs. I switched to beeswax. I just heat it up in a 3.00 garage sale crock pot, dump in the balls, let them soak, stirring as needed for 10 minutes or so, then remove them to a sheet of aluminum foil to cool. I store them like that with a heavy coat of the beeswax. Later I chuck them into a lathe & drill them and insert a threaded brass insert, I chuck up a small section of threaded rod in my cordless drill and thread on the ball with threaded insert. then I grab it with a triple folded paper towel and spin it at high rpm. It heats up and the excess wax gets buffed off and it leaves a nice finish. Done. The beeswax seems to work excellent as a finish and no oil is needed. For toys I would just heat up beeswax and brush on, then buff off, your done. I’m wondering what type of wood you would recommend for use with your beeswax/oil combo? Am coating some baby teethers and have looked at maple and cherry wood. Which wood do you think would work best with the coating? Thanks for the tutorial too – great stuff!!! I have used it on ash, maple, cherry, and black walnut with good results. 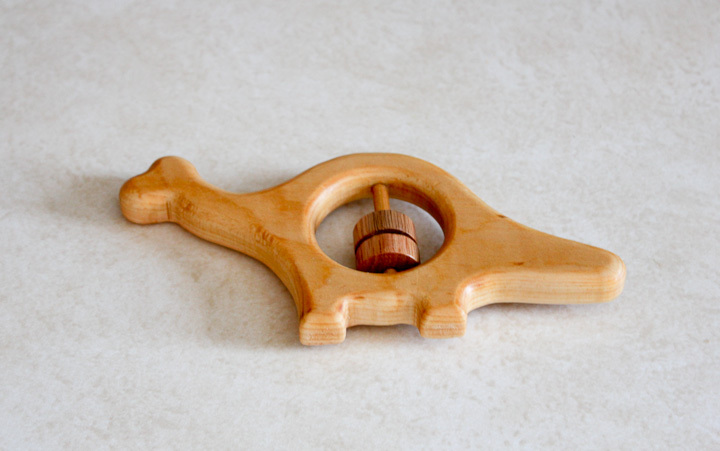 I really like maple, and primarily make my children toys from maple. It also happens that I there is a lot of maple on my property so when a tree falls due to a storm and I mill it into lumber it’s very likely to be maple. I’m delighted, it looks so cute! I also want to recommend the site https://woodencaterpillar.com/ maybe it will inspire you! Good luck!